Pictured from left to right: CHS CEO Jay Debertin with producers and New Leader Program participants Joshua Stutrud, Kevin and Jessica Severson, Julie and Scott Johnson, Stephanie and Brett Robinson, and Tyler Engstrom. 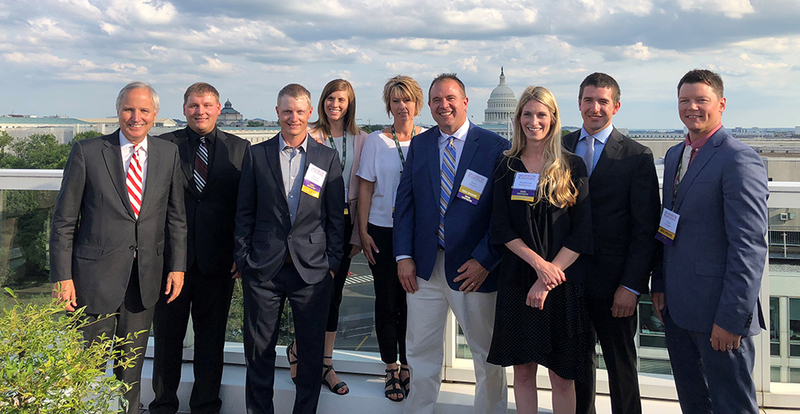 Brett and Stephanie Robinson of Ephrata, Washington, returned from their summer trip to Washington D.C. with a better understanding of federal policies facing the nation’s farmers. The Robinsons grow dry beans, sweet corn, grain corn, potatoes, peas, and onion seed in Grant County. The Robinsons joined six other young producers for the Political Advocacy with CHS Government Affairs program, an extension of the CHS New Leaders program aimed at learning skills critical for engaging effectively and making a powerful impact on issues relevant to CHS and its owners. Participants were nominated by their co-op managers because of the potential they possess for leadership within their respective co-ops and the agriculture industry in general. The Robinsons were nominated by CHS SunBasin Growers. The event was held in conjunction with the National Council of Farmer Cooperatives (NCFC) annual Washington conference. The New Leaders also participated in NCFC’s Political Advocacy & Leadership (PAL) program for young producers. As part of the Political Advocacy program, these next generation leaders joined CHS directors and senior leadership in meetings with members of Congress. CHS Government Affairs team explained how the legislative process operated and the most effective methods to make their voices heard on current issues facing farmers now and in the future. CHS SunBasin Growers held its annual CHS Harvest for Hunger fund raiser in March. Through the work of employees, farmers and producers, customers, local businesses and community members, CHS SunBasin Growers raised $8,746.60 in donations and gathered 122,128 pounds of food. It is continually inspiring to see the generosity of our participants, our communities and the businesses as they make our events and this campaign such a success. Thank you for your support in helping to fight hunger in our communities.